Fly to Southern Africa for a thrilling adventure at the Victoria Falls in Zambia and a game-rich luxury safari experience in Botswana. After your exhillirating safari, spend tranquil days of lounging on the pristine beaches of Intendance Bay at Banyan Tree Seychelles. Your safari experience: Botswana offers a legendary wilderness experience for African wildlife safaris, with some of the finest collections of luxury safari accommodation in Africa. On luxury safari in Botswana, you will experience an African wilderness journey like no other; the large concentration of large game in the private safari concessions is incomparable to elsewhere in Africa, making it the most highly-sought after destination for an authentic luxury safari, accessible to only a handful of visitors due to the limited number of authentic luxury camps, in truly private safari regions. On arrival in Africa and Seychelles, always experience a personalized VIP welcome and private transfer assistance by the dedicated Guided Safaris team. Start your African journey in Livingstone's Africa: Professionally guided tours of the Victoria Falls and sunset cruises on the beautiful Zambezi River are some of the memorable experiences that await you in peaceful Zambia. 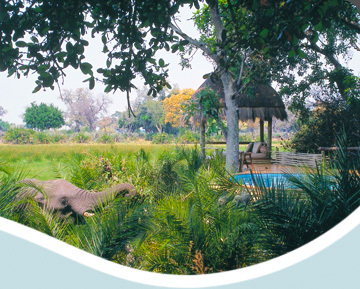 The Tongabezi Lodge is your luxury home on the shores of the Zambezi river. Your accommodation is upgraded to the private riverfront houses built around spectacular views while offering indulgence and privacy. The private balcony is open to the sounds and views of the Zambezi, amongst the branches of the riverine trees. The five individually-designed houses spread out over various levels offering uniqueness in concept and decor. Each Tongabezi house has a wide-canopied king-size bed overlooking awe inspiring Zambezi views. A private viewing deck and lounge offer tranquility and are often used for private in-suite dining. The bathrooms are also open-plan with shower and some with additional sunken baths for added safari romance. Suspended over the river, the houses become a part of their natural surroundings to fully experience the beauty and majesty of Zambia. Safari activities available include Elephant-back safaris and cultural heritage visits to the Livingstone Town & Museum. Zarafa Camp is an authentic luxury safari camp in Botswana. Located in the game-rich Selinda reserve, at the famous source of the Savute channel at Zibadianja Lagoon. The Zarafa region has been acclaimed as one of the greatest safari locations in the world, renowned for its unbelievable concentration of wildlife, both predators and a thousand-strong herds of Elephant and Buffalo. The luxuriously-appointed, quintessential tented accommodation at the highly boutique Zarafa Camp offer only 4 vintage-style canvas suites offering you a taste of original African safaris. Day and Night game drives and safari walks are fully-inclusive of your stay, led by professional and experienced safari guides. Zarafa Camp features a dining, lounge and bar area all surrounded by the African wilderness. The luxurious tented suites are linked via wooden platform walkways to connect to the main camp living areas. The beautiful canvas suites at Zarafa Camp encompass large, spacious bedrooms a writing desk, dressing area, private viewing deck with a view of the plains, a ‘sala’ (outdoor sun deck with loungers and private plunge pool) and en suite facilities with two showers: one indoors and the other a romantic nature shower open to the nightsky. The Mombo concession, located on Mombo Island, has quickly become possibly the most game-rich region in Botswana. Here you will encounter all of Africa's big game but also some of the most elusive species known to mankind. Daily safaris are conducted twice a day with expert guides local to region. Mombo camp has just nine luxuriously-furnished tented suites that are raised off the ground to offer beautiful views over the floodplains that always filled with game such as Elephant, Buffalo and the often the resident pride of lions who frequent the camp, offering wilderness spectacles right from safety and priliveged vantage of your room. The luxury tents have connecting walkways, up to 2-meters off the ground, allowing game to wander freely through the camp whilst ensuring guest safety. Mombo Camp accommodation is spacious with a master bedroom, en-suite bath facilities featuring twin His & Hers showers and an additional nature outdoor shower to indulge in the views. The main camp dining room and lounge areas overlook the plains and there is a beautiful pool lounge for relaxing in the heat of the day. On arrival at the Banyan Tree Seychelles, a welcome drink followed by quick, guaranteed check-in on arrival service sees you to your exquisite Beachfront Spa Pool Villa, set amid perfumed gardens with direct beach access to the inviting sea. Intendance Bay has been voted as one of the world's most beautiful beaches with its giant granite boulders, sensual pink sand and dramatic cliffside tropical forest background. It is here that the private villas of Banyan tree Resort sprawl amid rocks and lush surrounds open to panoramic views and natural orchestra of the birds and powerful sea. The Beachfront Spa Pool Villa offers deluxe amenities for your exclusive use: a Private pool, Private spa pavilion, garden with living and dining area, pool sundeck with king-size sun loungers, outdoor jet pool, steam room, spacious master bedroom with king-size bed, His & Her vanity and bath and direct beach access from your villa.